I found it ironic that this week's blessing was all about the senses, and a massive cold steamrolled 3 out of 5 of my senses as soon as I woke up on Monday morning. So with my ears clogged, my nose a snotty mess, and my taste buds on vacation, I found myself digging into sight and touch. Spring has sprung all around us, and my eyes were overjoyed feasting on the explosions of color amidst the sea of green everywhere. In O'Donahue's poem, he writes "May the fragrance of a breathing meadow refresh your heart and remind you you are a child of the earth." But for me, this week, it was not my sense of smell, but my sight that first brought me back to the arms of mama earth. I went to Drumlin Farm with my Kindergarteners this week, and though the sun was shining when the bus pulled up, the clouds opened as soon as we stepped onto the farm. The rain poured down on us as we walked around, investigating gopher holes, ant hills, fox hollows, and birds nests. By the end of the day, my "raincoat" was little more than a sopping wet outer layer soaking the clothes beneath it with rain water. But if I am being honest, I really didn't mind. The touch of the rain falling on my face, rolling down my cheeks, my clothes clinging to my skin, awoke in me a incredible feeling of gratitude... it was just warm enough outside to keep away any chills, the kids were all laughing and smiling as they tromped through puddles and danced between rain drops... it felt as though my heart was on the surface of my skin. 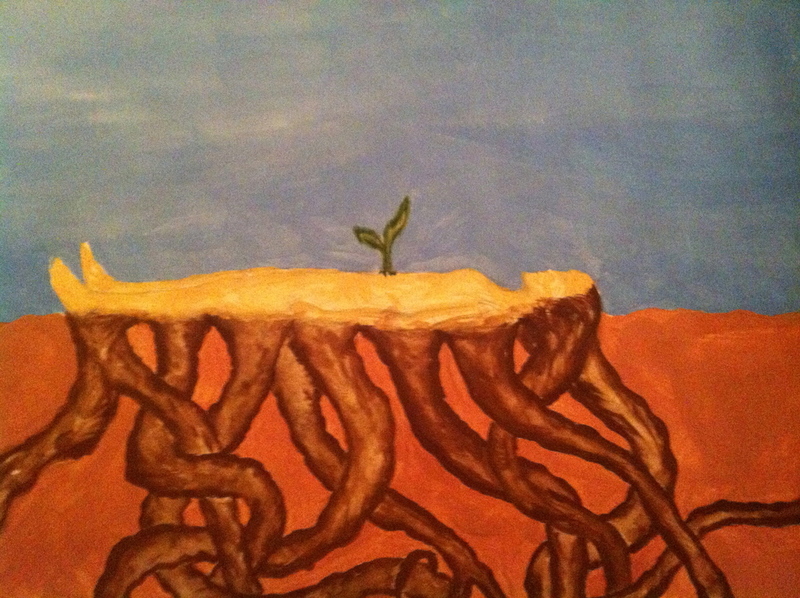 Last summer during my yoga teacher training, while lying in shavasana (rest pose) after an especially exhausting class, an image came to me: I imagined that every part of my body that was touching the mat was sprouting roots. The roots grew in every direction, through the floorboards and cement foundation of the building, and deep into the ground, intertwining with other roots they met as they plunged downward. That image has stayed with me and is often one I bring to my mind when I'm feeling lost or anxious. This week, I found myself sinking into that image a lot as I tuned my senses into the natural world surrounding me. So I put the image on paper. 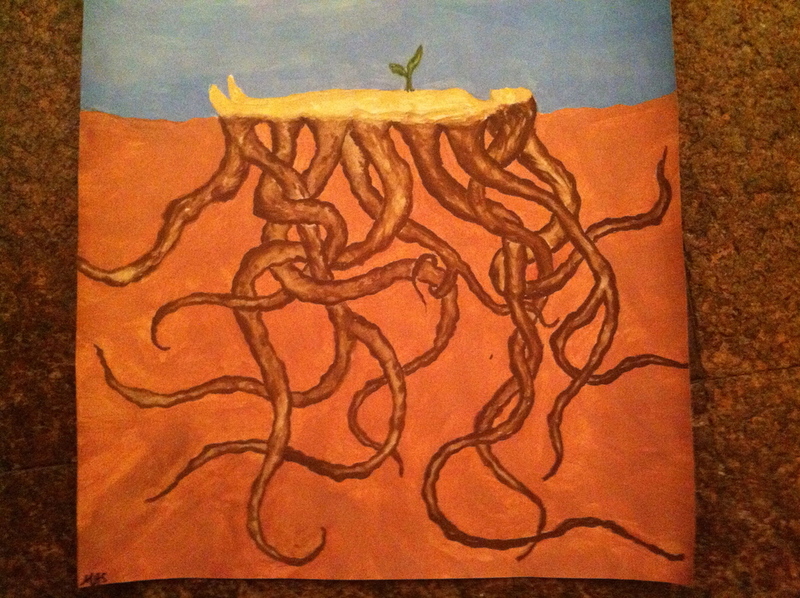 Initially I hadn't planned to incorporate any plant or growth beyond the root system in the ground, but after explaining the image to a good friend, she suggested adding a tiny plant coming out from the person's center. 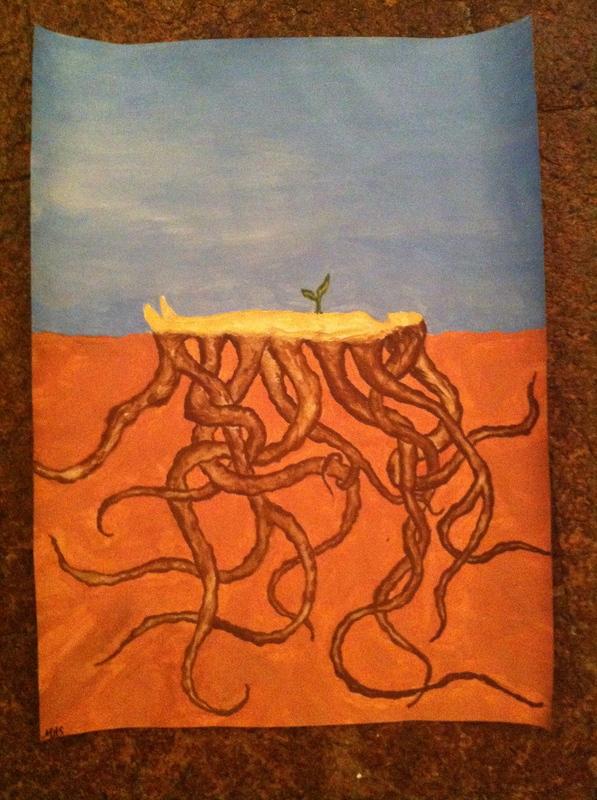 Though the plant sprouting from within her may be small, The woman in the painting has an incredible system of roots beneath her, grounding her, supporting her, nourishing her. They grow deeper than even she knows.